Where is The Stage @ Jericho's located? * All information would be kept confidential and used only for the purpose of a mailing list. You will be receiving updates about our performers as well as upcoming events. Does The Stage @ Jericho's serve food? We have since moved away from the cafe concept to focus more on providing a platform for musicians and bands. However, you may choose to buy food from outside and bring it up to The Stage @ Jericho's. Do note that no alcohol is permitted, this is a policy set by YMCA. We seek your kind cooperation in adhering to this policy. I am interested to perform, how can I apply? The Stage @ Jericho's aims to provide a free platform for aspiring musicians and bands to gain experience and exposure. Only the sound system and mic would be provided. Bands would have to bring their own musical instruments. 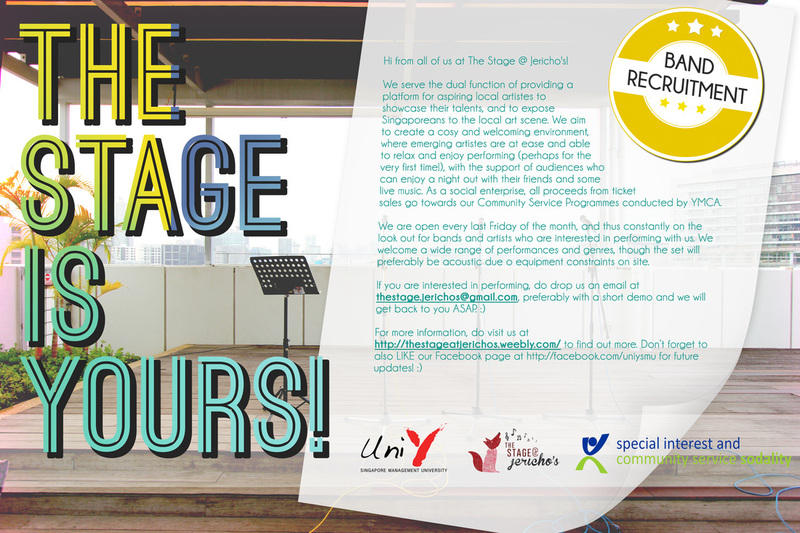 Drop us an email at thestage.jerichos@gmail.com if you're interested. provide a link or attachment of covers/previous performances/Facebook page. What do we do with our proceeds from the monthly events? Tickets are sold for $6 each. SMU students as well as friends of bands will be able to purchase tickets at $5 each. All proceeds goes to fund various other Uni-Y SMU community service activities. As a social enterprise we are also self sustaining and do not use funds from other programmes. Thus, we appreciate all the support from each an every one of our guests. Is the venue available for private bookings? Regretfully, we no longer accept private bookings as we would like to focus on our music events. Please visit YMCA's website: ymcaih.com.sg for more details about booking the rooftop for your events.